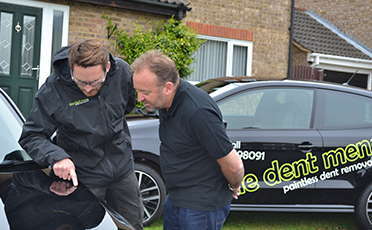 The Dent Men are a fully mobile paintless dent removal company providing a cost effective, convenient dent repair service throughout Cambridgeshire, Hertfordshire, Essex and parts of neighbouring counties. There’s a limit to what can be fixed using Paintless Dent Repair techniques, but that limit might be higher than you think. Sometimes people think that the damage is too bad for a paintless dent removal repair and go straight to a bodyshop, when in actual fact, we could fix the damage for much less. There are limitations to what we can do, but it’s worth finding out whether or not the damage is reapirable with us. Our technicians gently encourage the metalwork from behind to restore the panel back to its original condition. 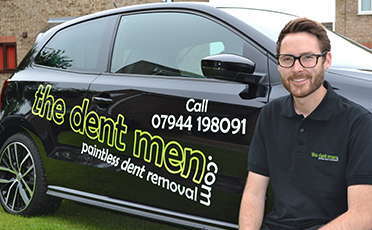 Because we do not use any fillers, paintless dent removal is a permanent solution to repair damage. Just take a look at our work and see for yourself. All of our tools comfortably fit into our vehicles so we are able to carry out repair work almost anywhere. Instead of losing your car to a bodyshop for a week, let us come to you, at home or at work and repair the damage quickly and professionally, while you get on with your day. 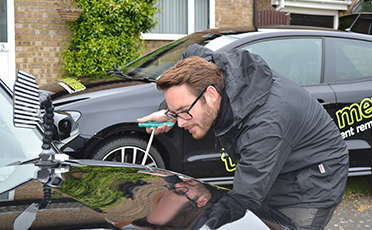 Paintless dent removal doesn’t involve re-painting your vehicle the total repair cost is considerably cheaper than any alternative solution. We do not use any disposable tools or materials so all you pay for is our expert service. We strive to not only give you a price that you are happy with, but one that you are ecstatic about enough to tell friends! Some kind person opened his door into mine at Tesco’s and left a dent. After some research I found The Dent Men and have them a call. Dent has completely gone and I couldn’t be happier with the service.